IL-10 producing T cells inhibit Ag-specific CD8+ T cell responses and may play a role in the immune dysregulation observed in HIV infection. We have previously observed the presence of HIV-specific IL-10-positive CD8+ T cells in advanced HIV disease. In this study, we examined the suppressive function of the Gag-specific IL-10-positive CD8+ T cells. Removal of these IL-10-positive CD8+ T cells resulted in increased cytolysis and IL-2, but not IFN-γ, production by both HIV- and human CMV-specific CD8+ T cells. In addition, these IL-10-positive CD8+ T cells mediated suppression through direct cell-cell contact, and had a distinct immunophenotypic profile compared with other regulatory T cells. We describe a new suppressor CD8+ T cell population in advanced HIV infection that may contribute to the immune dysfunction observed in HIV infection. Distinct CD8+ T cell populations with regulatory properties produce IL-10 (1, 2, 3). Suppressor CD8+ T cells have been shown to inhibit both CD4+ and CD8+ T cell effector functions (2, 4), although the mechanism of this inhibition is not well defined. Suppressor CD8+ T cells inhibit T cell proliferation and cytotoxicity via contact-dependent mechanisms and/or by using cytokines such as IL-10 (2, 5, 6). Suppressor CD8+ T cells have also been shown to decrease the expression of MHC class I on target cells through IL-10 secretion (3). Both CD4+ and CD8+ T cells have been shown to express high IL-10 levels in HIV infection (7, 8). However, the suppressor role of the IL-10-positive CD8+ T cells is not fully understood (9, 10, 11, 12, 13). IL-10 producing HIV-specific CD4+ regulatory T cells suppressed both CD4+ and CD8+ HIV-specific T cell function in vitro (14, 15, 16). Previous studies have found that the proliferation of CD4+ T cells from HIV-infected individuals was inversely associated with the levels of IL-10 and that responses were partially restored by anti-IL-10 Abs (17, 18). In addition, a higher frequency of CD4+ T cells producing IL-10 was associated with a more progressive HIV disease (19). We have previously demonstrated the association of HIV-specific, IL-10-positive CD8+ T cells with advanced HIV disease and higher plasma HIV RNA (20). We postulated that HIV-specific IL-10-positive CD8+ T cells exert an inhibitory effect on distinct populations of effector CD8+ T cells. In this study, we describe the novel suppressive effect of the HIV-specific IL-10-positive CD8+ T cells in regulating CD8+ T cell responses. HIV-positive volunteers (n = 10) were recruited from the “Research in Access to Care in the Homeless” (REACH) cohort in San Francisco, CA, as previously described (21). Demographic information and the CD4+ T cell count were obtained at the time of enrollment and blood draw. Institutional Review Board approvals were obtained from the California Department of Health Services and University of California San Francisco Committee on Human Research, and all study participants gave written informed consent. None of the study participants received antiretroviral therapy at the time of the study (>6 mo before enrollment). The HIV-1 RNA level was determined from the plasma using the Roche Amplicor 1.5 as per the manufacturer’s recommendations. PBMC were separated and cryopreserved in liquid nitrogen until assay time. Peptides corresponding to the sequences of the clade B consensus sequences of HIV-1 for Gag (www.hiv.lanl.gov/content/hiv-db/CONSENSUS/M_GROUP/Consensus.html) were synthesized as 15 aa overlapping by 11 aa (Mitochor Mimotopes). The Gag synthetic peptides used for all T cell assays were pooled into one single pool of peptides (total 123) with a final concentration of 1 μg/ml per peptide (22). A single pool of overlapping peptides corresponding to the amino acid sequence of the PP65 protein (BD Biosciences) was used to detect a human CMV (HCMV)3-specific response (23, 24). The detection of Gag-specific IL-10 production was performed using PBMC (1 × 106) incubated with Gag peptide pools for 2 h at 37°C in 5% CO2 in the presence of costimulatory anti-CD49d and anti-CD28 (1 μg/ml; BD Biosciences) followed by GolgiStop (BD Pharmingen) for 12–14 h as previously described to be the optimal incubation period for the detection of IL-10 without affecting the viability of the cells (25). LPS (1 ng/ml; Sigma-Aldrich) and medium alone without Ag stimulation were used as positive and negative controls, respectively. Cells were then stained with the following Abs: IL-10 PE, CD4 PE Cy7, CD3 PerCP Cy5.5, and CD8 Pacific Blue (BD Pharmingen). A minimum of 30,000 CD3+ cells per sample was acquired using a 6-color flow cytometer (LSR II; BD Biosciences) and analysis was performed by FlowJo software (TreeStar). The results were expressed as the percentage of IL-10-positive CD8+ T cells (percentage positive = percentage of Ag-specific − percentage of negative control). Responses ≥0.1% and two times the background were considered positive. All volunteers demonstrated significant IL-10 production following LPS stimulation. Background expression was <0.05%. IL-10-positive cells were isolated using the MACS cytokine secretion/separation kit following the manufacturer’s protocol (Miltenyi Biotec). Briefly, PBMC were stimulated with Gag B peptides for 6 h and then labeled with anti-IL-10 PE detection Ab followed by magnetic labeling with anti-PE microbeads. IL-10-positive cells were isolated by magnetic separation using the MACS columns. Unfractionated and eluted IL-10-negative PBMC were stimulated for an additional 6 h with either Gag B or CMV PP65 peptides in a CD107a/b degranulation and intracellular cytokine staining assays as described below. A degranulation assay was performed as previously described (26). Cytotoxic CD8+ T cell function has been shown to correlate directly with T cell degranulation, which is a prerequisite process of perforin/granzyme-mediated lytic function (27) and can be measured by the increased expression of surface CD107 (28). Briefly, PBMC (1 × 106) were incubated with 1 μg/ml anti-CD49d and anti-CD28 (BD Biosciences), anti-CD107a and anti-CD107b FITC (CD107a/b) (BD Biosciences), and Gag B peptide pools in a 0.2-ml final volume for 6 h in the presence of GolgiStop (BD Pharmingen). Staphylococcus enterotoxin B (1 μg/ml; Sigma-Aldrich) and medium alone were used as positive and negative controls respectively. Cells were then stained with the following Abs: IFN-γ PE, CD4 PE Cy7, CD3 PerCP Cy5.5, IL-2 allophycocyanin, and CD8 Pacific Blue (BD Pharmingen). Sample acquisition and analysis was performed as described above. Results were expressed as the percentage of CD107a/b-, IFN-γ-, or IL-2-positive CD8+ T cells (percentage of positive = percentage of Ag-specific − percentage of negative control). Responses ≥0.1% and two times the background were considered positive. All volunteers demonstrated significant CD107a/b, IFN-γ, and IL-2 expression following Staphylococcus enterotoxin B stimulation. Background expression was <0.1%. PBMC were cultured with or without IL-10-positive cells in the same well or separated by a microporous membrane (0.4-μm pore size; Costar, Corning) as previously described (29). Briefly, PBMC were placed into the lower chamber of a 24-well plate and the IL-10-positive cells were added into the same chamber or the upper chamber. Culture, stimulation, and staining procedures were performed as described above. PBMC were stained for FOXP3 expression following the manufacturer’s protocol (eBioscience) with some modifications. Briefly, PBMC (1 × 106) were incubated with Gag B peptide pools for 12–14 h as described above for intracellular IL-10 staining. Cells were then stained with different combinations of the Abs IL-10 PE, CD4 PE Cy7, CD3 PerCP Cy5.5, CD25 allophycocyanin, FOXP3 allophycocyanin, and CD8 Pacific Blue (BD Pharmingen) and analysis was performed by flow cytometry as described above. The percentage of IL-10-positive cells was determined and the extent of FOXP3 and CD25 expression was also assessed. Results were expressed as the fraction of IL-10-positive cells that expressed FOXP3 or CD25 over the total number of IL-10-positive cells (equivalent to 100%). Groups were compared using the paired t test, and analysis was performed with PRISM software version 4.02 (GraphPad). Statistical significance was defined as p < 0.05. We have previously observed the association of HIV-specific, IL-10-positive CD8+ T cells with advanced disease and decreased HIV-specific cytolysis (20). We examined the effect of in vitro removal of the Gag-specific IL-10-positive CD8+ T cells from HIV-positive volunteers (n = 10). All volunteers had a CD4 T cell count of <200 cells/mm3 (median, 139; range, 11–199) and HIV plasma RNA of >75,000 copies/ml (median, 227,000; range, 79,000–690,000). In addition, all volunteers demonstrated significant Gag-specific, IL-10-positive CD8+ T cell responses (median, 0.4%; range, 0.2–1.7%). No Gag-specific IL-10-positive CD4+ T cell responses were detected (data not shown). CD107a/b expression (26) and IL-2 and IFN-γ production by Gag-specific CD8+ T cells were also determined concurrently. All volunteers demonstrated significant responses to at least one of the three markers examined. Eluted IL-10-negative PBMC were evaluated for HIV-specific cytolysis and IFN-γ production using the CD107a/b degranulation and intracellular cytokine staining assay. Representative plots of the effect of the removal of HIV-specific, IL-10-positive CD8+ T cells on HIV-specific cytolysis are shown in Fig. 1⇓A. 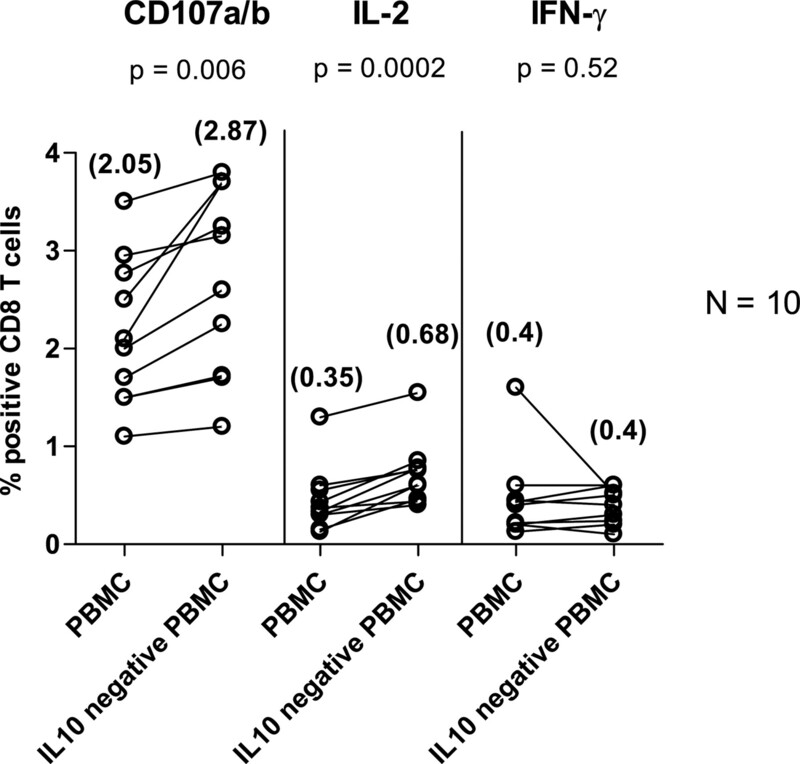 Removal of the IL-10-positive CD8+ T cells resulted in a significantly increased frequency of HIV-specific CD107a/b-positive (p = 0.0006), but not IFN-γ-positive (p = 0.28), CD8+ T cells compared with unfractionated PBMC (Fig. 1⇓B). Adding back these autologous Gag-specific IL-10-positive CD8+ T cells to the eluted IL-10-negative PBMC significantly reduced the frequency of CD107a/b-positive CD8+ T cells compared with IL-10-negative PBMC alone (p = 0.005; data not shown), comparable to the frequency observed in unfractionated PBMC (p = 0.4; data not shown). These results suggest that the Gag-specific, IL-10-positive CD8+ T cells may have an inhibitory effect on HIV-specific cytolytic function. The removal of HIV-specific, IL-10-positive CD8+ T cells is associated with increased HIV-specific cytolysis. PBMC were stimulated with Gag B peptides and then IL-10-positive cells were isolated. Eluted IL-10-negative PBMC were stimulated for an additional 6 h with Gag B peptides in the presence of anti-CD107a/b FITC and then stained with anti-IFN-γ PE, anti-CD3 PerCP Cy5.5, anti-CD4 PE Cy7, and anti-CD8 Pacific Blue and analyzed by flow cytometry. Samples were first gated on the CD3+CD8+ lymphocyte population and then the percentages of CD107a/b- and IFN-γ-positive cells were determined. The results were expressed as the percentage of Gag-specific CD8+ T cells expressing CD107a/b or IFN-γ after subtraction of the background values. A, Representative plots of Gag-specific CD8+ T cells expressing CD107a/b or IFN-γ in the presence or absence of IL-10-positive cells. B, Dashed line represents the cutoff for significant CD107a/b and IFN-γ expression. The numbers in parentheses are median values. The two circles joined by a line represent the values obtained from the same individual, and analysis was performed by a paired t test. Significant differences were observed in the percent of Gag-specific CD8+ T cells expressing CD107a/b (p = 0.0006), but not IFN-γ (p = 0.28), between the two groups. Regulatory T cells have been shown to modulate IL-2 production by T cells in vitro (30). We next examined the effect of in vitro removal of the Gag-specific IL-10-positive CD8+ T cells on HIV-specific IL-2-positive CD8+ T cells. No Gag-specific IL-2-positive CD4+ T cell responses were detected in our study volunteers (data not shown). Representative plots are shown in Fig. 2⇓A. Removal of the IL-10-positive CD8+ T cells resulted in significantly increased frequency of HIV-specific IL-2-positive CD8+ T cells compared with the unfractionated PBMC (p = 0.005; Fig. 2⇓B). Adding back these autologous Gag-specific IL-10-positive CD8+ T cells significantly decreased the frequency of IL-2-positive CD8+ T cells compared with IL-10-negative PBMC alone (p = 0.007; data not shown), comparable to the frequency observed in unfractionated PBMC (p = 0.7; data not shown). These results suggest that the Gag-specific IL-10-positive CD8+ T cells may have an inhibitory effect on HIV-specific IL-2 production by CD8+ T cells. The removal of HIV-specific IL-10-positive CD8+ T cells is associated with increased HIV-specific IL-2-positive CD8+ T cells. PBMC were stimulated with Gag B peptides and then IL-10-positive cells were isolated. Eluted IL-10-negative PBMC were stimulated for an additional 6 h with Gag B peptides and then stained with anti-IL-2 PE, anti-CD3 PerCP Cy5.5, anti-CD4 PE Cy7, and anti-CD8 Pacific Blue and analyzed by flow cytometry. Samples were first gated on the CD3+CD8+ lymphocyte population and then the percentage of IL-2-positive CD8+ T cells was determined. Results were expressed as the percentage of Gag-specific CD8+ T cells expressing IL-2 after subtraction of the background values. A, Representative plots of Gag-specific CD8+ T cells expressing IL-2 in the presence or absence of IL-10-positive cells. B, Dashed line represents the cutoff for significant IL-2 expression. The numbers in parentheses are median values. The two circles joined by a line represent the values obtained from the same individual, and analysis was performed by paired t test. Significant differences were observed in the percentage of Gag-specific CD8+ T cells expressing IL-2 (p = 0.005) between the two groups. Suppressor CD8+ T cells have been shown to mediate non-Ag specific suppression of T cell responses (2, 3, 31, 32). To determine whether Gag-specific, IL-10-positive CD8+ T cells can also suppress non-HIV-specific T cell responses, we analyzed HCMV-specific responses in the same study population. PP65-specific CD107a/b, IL-2, and IFN-γ CD8+ T cell responses were detected in all 10 study participants (Fig. 3⇓). No HCMV-specific, IL-10-positive CD4+ or CD8+ T cell responses were detected (data not shown). Interestingly, removal of the Gag-specific IL-10-positive CD8+ T cells resulted in a significantly increased frequency of PP65-specific CD107a/b-positive and IL-2-positive, but not IFN-γ-positive, CD8+ T cells (see Fig. 5⇓; p = 0.006, p = 0.0002, and p = 0.52, respectively). Adding back autologous Gag-specific, IL-10-positive CD8+ T cells resulted in a significantly decreased frequency of CD107a/b-positive and IL-2-positive, HCMV-specific CD8+ T cells compared with IL-10-negative PBMC alone (p = 0.02, and p = 0.001 for CD107a/b and IL-2, respectively; data not shown), comparable to the frequencies observed in unfractionated PBMC (p = 0.2, and p = 0.7 for CD107a/b and IL-2, respectively; data not shown). These results suggest that the Gag-specific IL-10-positive CD8+ T cells do not require Ag specificity to inhibit cytolysis and IL-2 production. The removal of HIV-specific, IL-10-positive CD8+ T cells is associated with increased CMV-specific cytolysis and increased frequency of CMV-specific IL-2-positive CD8+ T cells. PBMC were stimulated with Gag B peptides and then IL-10-positive cells were isolated. Eluted IL-10-negative PBMC were stimulated for an additional 6 h with CMV PP65 peptides in the presence of anti-CD107a/b FITC and then stained with anti-IFN-γ PE, anti-CD3 PerCP Cy5.5, anti-CD4 PE Cy7, anti-IL-2 allophycocyanin, and anti-CD8 Pacific Blue and analyzed by flow cytometry. Samples were first gated on the CD3+CD8+ lymphocyte population and then the percentages of CD107a/b-, IL-2-, and IFN-γ-positive cells were determined. The results were expressed as percentage of HCMV-specific CD8+ T cells expressing CD107a/b, IL-2, or IFN-γ after subtraction of the background values. The dashed line represents the cutoff for significant CD107a/b, IL-2, and IFN-γ expression. The percentages in parentheses are median values. The two circles joined by a line represent the values obtained from the same individual, and analysis was performed by a paired t test. Significant differences were observed in the percentages of HCMV-specific CD8+ T cells expressing CD107a/b (p = 0.006) and IL-2 (p = 0.0002), but not IFN-γ (p = 0.52), between the two groups. Suppressor CD8+ T cells exert their inhibitory function on T cell proliferation and CTL via contact-dependent mechanisms and/or by using cytokines such as IL-10 and TGF-β (2, 5, 6). To determine the mechanism by which Gag-specific, IL-10-positive CD8+ T cells mediated the suppression of HIV-specific responses, we performed transwell experiments on four HIV-positive volunteers. Representative plots are shown in Fig. 4⇓. Gag-specific IL- 10-positive CD8+ T cells, when separated from the IL-10-negative PBMC by a microporous membrane, had no effect on HIV-specific CD107a/b expression and IL-2 production compared with IL-10-negative PBMC alone. In contrast, the coculture of IL-10-positive CD8+ T cells and IL-10-negative PBMC in the same well led to a strong suppression of HIV-specific CD107a/b-positive and IL-2-positive, but not IFN-γ-positive, CD8+ T cells compared with IL-10-negative PBMC alone. Analysis of the HCMV-specific responses in these four HIV-positive volunteers was also performed and the results were similar to the observed suppressive effects of the IL-10-positive CD8+ T cells on the HIV-specific responses. Representative plots are shown in Fig. 5⇓. These results indicate that Gag-specific IL-10-positive CD8+ T cells suppress HIV- and HCMV-specific cytolysis and IL-2 production by direct cell-cell contact. IL-10-positive CD8+ T cells decrease HIV-specific CD107a/b expression and IL-2 production by direct cell-cell contact. PBMC were stimulated with Gag B peptides then IL-10-positive cells were isolated. Eluted IL-10-negative PBMC were cultured for an additional 6 h with Gag B peptides and anti-CD107a/b FITC, with or without IL-10-positive cells in the same well or separated by a microporous membrane. PBMC were then stained with anti-IFN-γ PE, anti-CD3 PerCP Cy5.5, anti-CD4 PE Cy7, anti-IL-2 allophycocyanin, and anti-CD8 Pacific Blue and analyzed by flow cytometry. Samples were first gated on the CD3+CD8+ lymphocyte population and then the percentage of CD107a/b-, IFN-γ-, and IL-2-positive cells were determined. Results were expressed as the percentages of Gag-specific CD8+ T cells expressing CD107a/b, IFN-γ, or IL-2 after subtraction of the background values. Plots are representative of four independent experiments yielding similar results. IL-10-positive CD8+ T cells decrease HCMV-specific CD107a/b expression and IL-2 production by direct cell-cell contact. PBMC were stimulated with Gag B peptides and then IL-10-positive cells were isolated. Eluted IL-10-negative PBMC were cultured for an additional 6 h with HCMV peptides and anti-CD107a/b FITC, with or without IL-10-positive cells in the same well or separated by a microporous membrane. PBMC were then stained with anti-IFN-γ PE, anti-CD3 PerCP Cy5.5, anti-CD4 PE Cy7, anti-IL-2 allophycocyanin, and anti-CD8 Pacific Blue and analyzed by flow cytometry. Samples were first gated on the CD3+CD8+ lymphocyte population then the percentages of CD107a/b-, IFN-γ-, and IL-2-positive cells were determined. 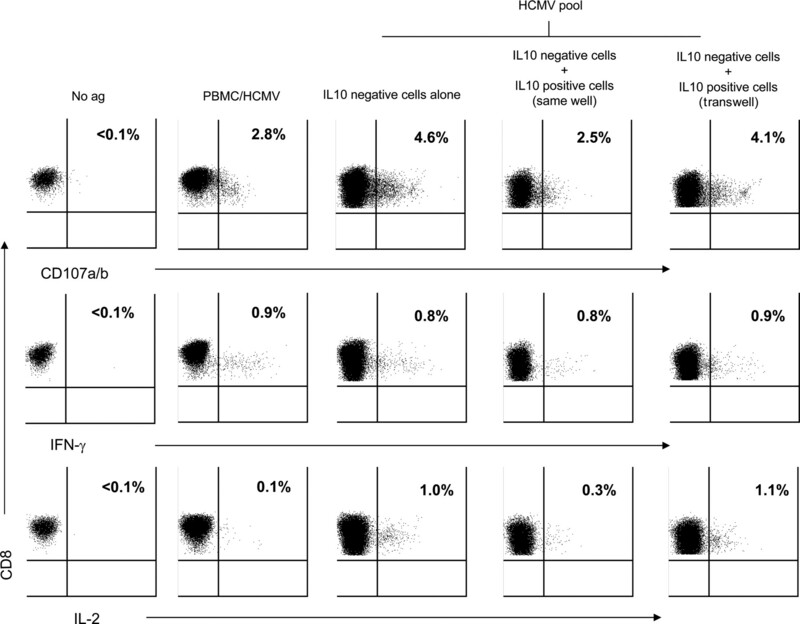 Results were expressed as percent of HCMV-specific CD8+ T cells expressing CD107a/b, IFN-γ, or IL-2 after subtraction of the background values. Plots are representative of four independent experiments yielding similar results. Suppressor CD8+ T cells in HIV-negative individuals are CD28-negative (5, 6) and express CD25, CD103, FOXP3, TNF receptor-related protein (GITR), and CTLA-4 (33, 34, 35, 36, 37, 38, 39, 40). We determined whether the HIV-specific IL-10-positive CD8+ T cells express a similar immunophenotypic profile. PBMC were stimulated with Gag B peptides and the extent of FOXP3 and CD25 expression by the Gag-specific IL-10-positive CD8+ T cells was assessed. Representative plots of the phenotype of the HIV-specific, IL-10-positive CD8+ T cells are shown in Fig. 6⇓. IL-10-positive CD8+ T cells were mainly FOXP3-negative and CD25-negative (medians of 9 and 8.5% for FOXP3 and CD25, respectively; data not shown). These results suggest that the Gag-specific, IL-10-positive CD8+ T cells have a distinct regulatory T cell immunophenotypic profile compared with other non-HIV suppressor CD8+ T cells and support our current use of functional characterization by IL-10 production to identify this suppressor T cell population in HIV infection. HIV-specific IL-10-positive CD8+ T cells do not express FOXP3 or CD25. PBMC were stimulated with Gag B peptides and then stained with anti-IL-10 PE, anti-CD3 PerCP Cy5.5, anti-CD4 PE Cy7, anti-CD8 Pacific Blue, and either anti-FOXP3 allophycocyanin or anti-CD25 allophycocyanin and then analyzed by flow cytometry. Samples were first gated on the CD3+CD8+ lymphocyte populations and then the percentages of IL-10-positive cells were determined and the extent of FOXP3 and CD25 expression was also assessed. Representative plots of Gag-specific IL-10-positive CD8+ T cells expressing FOXP3 and CD25 are shown. The values marked with an asterisk represent the fraction of IL-10-positive cells that express FOXP3 or CD25 over the total number of IL-10-positive cells (equivalent to 100%). Regulatory T cells are implicated in modulating immune responses to chronic viral infections including HIV (41). CD4+ regulatory T cells inhibit both CD4+ and CD8+ T cell-mediated HIV-specific immune responses in vitro and may have HIV specificity (14, 15, 16). However, the role of suppressor CD8+ T cells in HIV infection has not been fully addressed. In this study, we observed significantly increased HIV- and HCMV-specific cytolysis following in vitro removal of the Gag-specific, IL-10-positive CD8+ T cells. These results led us to postulate that the Gag-specific, IL-10-positive CD8+ T cells impair the ability of both HIV- and non-HIV-specific CTL to kill infected target cells by suppressing HIV-specific, CD8+ T cell degranulation. In addition, the Gag-specific IL-10-positive CD8+ T cells displayed a suppressive effect on more than one CD8+ T cell function, including the inhibition of IL-2 production. 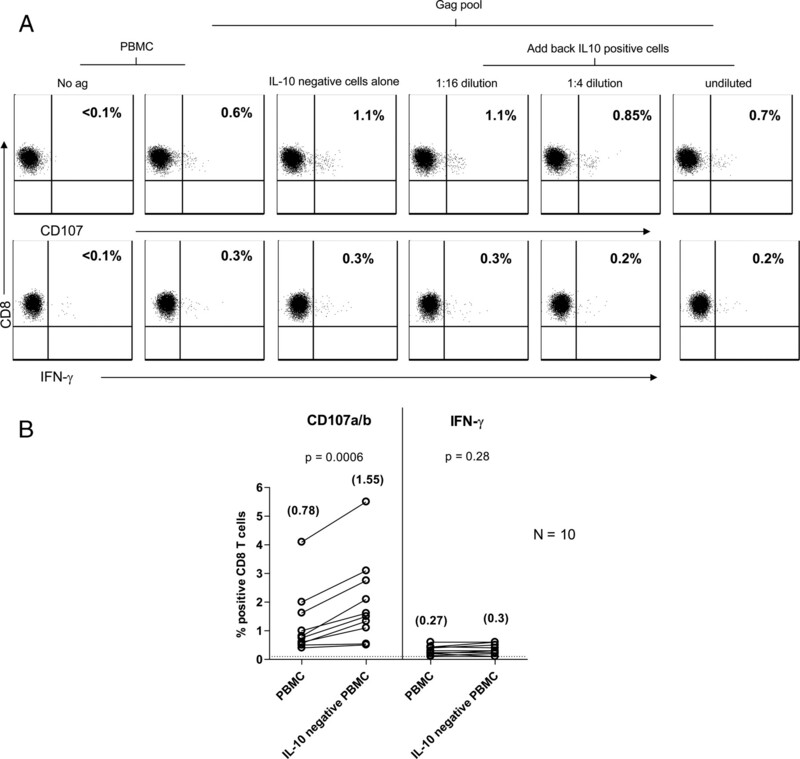 The apparent lack of effect on IFN-γ-positive CD8+ T cells suggest that inhibition by the Gag-specific IL-10-positive CD8+ T cells may be very selective. Our data support a mechanism of Ag-specific induction of suppressor IL-10-positive CD8+ T cells, which then exert suppression in a nonspecific manner (42). We have described the presence of suppressor IL-10-positive CD8+ T cells that are Gag specific. However, suppressor IL-10-positive CD8+ T cells specific to other HIV Ags may also exist. Whether distinct populations of HIV-specific IL-10-positive CD8+ T cells display similar inhibition remains to be determined. We have demonstrated that the suppression by Gag-specific IL-10-positive CD8+ T cells appeared to be mediated by direct cell-cell contact. We postulate that this suppression is mediated by similar mechanisms that were described previously in other non-HIV regulatory T cell populations. Suppression may occur through direct binding of inhibitory cell surface molecules such as CTLA-4 to costimulatory molecules (including CD80 and CD86) on effector T cells (43, 44). These HIV-specific suppressor CD8+ T cells may also recognize MHC peptide complexes on the cell surface of APCs, triggering the up-regulation of the inhibitory receptors Ig-like transcripts (ILT)3 and ILT4 and the down-regulation of costimulatory molecules rendering the APC tolerogenic (33, 45, 46). In addition, programmed death-1 ligation has been suggested as a suppressor mechanism of regulatory T cells resulting in decreased T cell proliferation and IL-2 production (47, 48) and may also be involved. Our current findings do not rule out a concomitant suppressive effect of IL-10 on cytolysis and IL-2 production. We have previously observed that rIL-10 suppressed in vitro HIV-specific CD107a/b expression (20). IL-10 has been shown to inhibit IL-2 production by CD4+ T cells (49) and to induce the up-regulation of ILT4 expression on monocytes and dendritic cells from HIV-infected individuals (50). Suppressor CD8+ T cells have been shown to decrease the expression of MHC class I on target cells through IL-10 secretion (3). Suppression by the HIV-specific IL-10-positive CD8+ T cells may involve the down-regulation of HLA expression on APC and reduce the effectiveness of Ag presentation. It is likely that these IL-10-positive CD8+ T cells exert their suppressive function in vivo by multiple mechanisms that may be complementary or independent. Gag-specific IL-10-positive CD8+ T cells may produce other cytokines that contribute to the observed suppressive effect. Of particular interest is the role of TGF-β that was previously shown to trigger the up-regulation of CTLA-4 expression (51, 52, 53) and inhibit T cell proliferation and IL-2 production (54). In this study, we identify a novel population of HIV-specific IL-10-positive CD8+ T cells that appear to suppress multiple HIV- and non-HIV-specific T cell functions and likely play an important role in HIV-associated immune dysfunction. The presence of these suppressor IL-10-positive CD8+ T cells may influence the maintenance of T cell responses and the effectiveness of T cell-based vaccines in HIV-infected individuals with advanced disease. This suppressor IL-10-positive CD8+ T cell population is likely distinct from the previously described effector Tc2 cells (reviewed in Ref. 55). Tc2 cells were shown to be cytotoxic via the perforin and Fas pathways and produce mainly IL-4, IL-5, IL-10, and TGF-β (56). Understanding the precise mechanisms by which these HIV-specific IL-10-positive CD8+ T cells exert their suppressive functions will elucidate their contribution to the impaired immune system in HIV infection. ↵1 This work was supported by National Institutes of Health Grants AI43885 and MH54907. ↵3 Abbreviations used in this paper: HCMV, human CMV; ILT, Ig-like transcript. Cortesini, R., J. LeMaoult, R. Ciubotariu, N. S. Cortesini. 2001. CD8+CD28− T suppressor cells and the induction of antigen-specific, antigen-presenting cell-mediated suppression of Th reactivity. Immunol. Rev. 182: 201-206. Filaci, G., M. Fravega, D. Fenoglio, M. Rizzi, S. Negrini, R. Viggiani, F. Indiveri. 2004. Non-antigen specific CD8+ T suppressor lymphocytes. Clin. Exp. Med. 4: 86-92. Filaci, G., M. Fravega, S. Negrini, F. Procopio, D. Fenoglio, M. Rizzi, S. Brenci, P. Contini, D. Olive, M. Ghio, et al 2004. Nonantigen specific CD8+ T suppressor lymphocytes originate from CD8+CD28− T cells and inhibit both T-cell proliferation and CTL function. Hum. Immunol. 65: 142-156. Jarvis, L. B., M. K. Matyszak, R. C. Duggleby, J. C. Goodall, F. C. Hall, J. S. Gaston. 2005. Autoreactive human peripheral blood CD8+ T cells with a regulatory phenotype and function. Eur. J. Immunol. 35: 2896-2908. Kumar, V.. 2004. Homeostatic control of immunity by TCR peptide-specific Tregs. J. Clin. Invest. 114: 1222-1226. Jiang, H., L. Chess. 2004. An integrated view of suppressor T cell subsets in immunoregulation. J. Clin. Invest. 114: 1198-1208. Graziosi, C., G. Pantaleo, K. R. Gantt, J. P. Fortin, J. F. Demarest, O. J. Cohen, R. P. Sekaly, A. S. Fauci. 1994. Lack of evidence for the dichotomy of TH1 and TH2 predominance in HIV-infected individuals. Science 265: 248-252. Zanussi, S., C. Simonelli, M. D’Andrea, C. Caffau, M. Clerici, U. Tirelli, P. DePaoli. 1996. CD8+ lymphocyte phenotype and cytokine production in long-term non-progressor and in progressor patients with HIV-1 infection. Clin. Exp. Immunol. 105: 220-224. Chen, W. F., A. Zlotnik. 1991. IL-10: a novel cytotoxic T cell differentiation factor. J. Immunol. 147: 528-534. Rohrer, J. W., J. H. Coggin, Jr. 1995. CD8 T cell clones inhibit antitumor T cell function by secreting IL-10. J. Immunol. 155: 5719-5727. Taga, K., G. Tosato. 1992. IL-10 inhibits human T cell proliferation and IL-2 production. J. Immunol. 148: 1143-1148. Ebert, E. C.. 2000. IL-10 enhances IL-2-induced proliferation and cytotoxicity by human intestinal lymphocytes. Clin. Exp. Immunol. 119: 426-432. Kang, S. S., P. M. Allen. 2005. Priming in the presence of IL-10 results in direct enhancement of CD8+ T cell primary responses and inhibition of secondary responses. J. Immunol. 174: 5382-5389. Kinter, A. L., M. Hennessey, A. Bell, S. Kern, Y. Lin, M. Daucher, M. Planta, M. McGlaughlin, R. Jackson, S. F. Ziegler, A. S. Fauci. 2004. CD25+CD4+ regulatory T cells from the peripheral blood of asymptomatic HIV-infected individuals regulate CD4+ and CD8+ HIV-specific T cell immune responses in vitro and are associated with favorable clinical markers of disease status. J. Exp. Med. 200: 331-343. Weiss, L., V. Donkova-Petrini, L. Caccavelli, M. Balbo, C. Carbonneil, Y. Levy. 2004. Human immunodeficiency virus-driven expansion of CD4+CD25+ regulatory T cells, which suppress HIV-specific CD4 T-cell responses in HIV-infected patients. Blood 104: 3249-3256. Aandahl, E. M., J. Michaelsson, W. J. Moretto, F. M. Hecht, D. F. Nixon. 2004. Human CD4+ CD25+ regulatory T cells control T-cell responses to human immunodeficiency virus and cytomegalovirus antigens. J. Virol. 78: 2454-2459. Kumar, A., J. B. Angel, M. P. Daftarian, K. Parato, W. D. Cameron, L. Filion, F. Diaz-Mitoma. 1998. Differential production of IL-10 by T cells and monocytes of HIV-infected individuals: association of IL-10 production with CD28-mediated immune responsiveness. Clin. Exp. Immunol. 114: 78-86. Clerici, M., T. A. Wynn, J. A. Berzofsky, S. P. Blatt, C. W. Hendrix, A. Sher, R. L. Coffman, G. M. Shearer. 1994. Role of interleukin-10 in T helper cell dysfunction in asymptomatic individuals infected with the human immunodeficiency virus. J. Clin. Invest. 93: 768-775. Ostrowski, M. A., J. X. Gu, C. Kovacs, J. Freedman, M. A. Luscher, K. S. MacDonald. 2001. Quantitative and qualitative assessment of human immunodeficiency virus type 1 (HIV-1)-specific CD4+ T cell immunity to gag in HIV-1-infected individuals with differential disease progression: reciprocal interferon-γ and interleukin-10 responses. J. Infect. Dis. 184: 1268-1278. Elrefaei, M., B. Barugahare, F. Ssali, P. Mugyenyi, H. Cao. 2006. HIV-specific IL-10-positive CD8+ T cells are increased in advanced disease and are associated with decreased HIV-specific cytolysis. J. Immunol. 176: 1274-1280. Moss, A. R., J. A. Hahn, S. Perry, E. D. Charlebois, D. Guzman, R. A. Clark, D. R. Bangsberg. 2004. Adherence to highly active antiretroviral therapy in the homeless population in San Francisco: a prospective study. Clin. Infect. Dis. 39: 1190-1198. McEvers, K., M. Elrefaei, P. Norris, S. Deeks, J. Martin, Y. Lu, H. Cao. 2005. Modified anthrax fusion proteins deliver HIV antigens through MHC class I and II pathways. Vaccine 23: 4128-4135. Maecker, H. T., H. S. Dunn, M. A. Suni, E. Khatamzas, C. J. Pitcher, T. Bunde, N. Persaud, W. Trigona, T. M. Fu, E. Sinclair, et al 2001. Use of overlapping peptide mixtures as antigens for cytokine flow cytometry. J. Immunol. Methods 255: 27-40. Elrefaei, M., N. El-Sheikh, K. Kamal, H. Cao. 2003. HCV-specific CD27− CD28− memory T cells are depleted in hepatitis C virus and Schistosoma mansoni co-infection. Immunology 110: 513-518. McElroy, M. D., M. Elrefaei, N. Jones, F. Ssali, P. Mugyenyi, B. Barugahare, H. Cao. 2005. Coinfection with Schistosoma mansoni is associated with decreased HIV-specific cytolysis and increased IL-10 production. J. Immunol. 174: 5119-5123. Barry, M., R. C. Bleackley. 2002. Cytotoxic T lymphocytes: all roads lead to death. Nat. Rev. Immunol. 2: 401-409. Betts, M. R., D. A. Price, J. M. Brenchley, K. Lore, F. J. Guenaga, A. Smed-Sorensen, D. R. Ambrozak, S. A. Migueles, M. Connors, M. Roederer, et al 2004. The functional profile of primary human antiviral CD8+ T cell effector activity is dictated by cognate peptide concentration. J. Immunol. 172: 6407-6417. Boettler, T., H. C. Spangenberg, C. Neumann-Haefelin, E. Panther, S. Urbani, C. Ferrari, H. E. Blum, F. von Weizsacker, R. Thimme. 2005. T cells with a CD4+CD25+ regulatory phenotype suppress in vitro proliferation of virus-specific CD8+ T cells during chronic hepatitis C virus infection. J. Virol. 79: 7860-7867. Thornton, A. M., E. M. Shevach. 1998. CD4+CD25+ immunoregulatory T cells suppress polyclonal T cell activation in vitro by inhibiting interleukin 2 production. J. Exp. Med. 188: 287-296. Balashov, K. E., S. J. Khoury, D. A. Hafler, H. L. Weiner. 1995. Inhibition of T cell responses by activated human CD8+ T cells is mediated by interferon-γ and is defective in chronic progressive multiple sclerosis. J. Clin. Invest. 95: 2711-2719. Filaci, G., S. Bacilieri, M. Fravega, M. Monetti, P. Contini, M. Ghio, M. Setti, F. Puppo, F. Indiveri. 2001. Impairment of CD8+ T suppressor cell function in patients with active systemic lupus erythematosus. J. Immunol. 166: 6452-6457. Manavalan, J. S., S. Kim-Schulze, L. Scotto, A. J. Naiyer, G. Vlad, P. C. Colombo, C. Marboe, D. Mancini, R. Cortesini, N. Suciu-Foca. 2004. Alloantigen specific CD8+CD28− FOXP3+ T suppressor cells induce ILT3+ ILT4+ tolerogenic endothelial cells, inhibiting alloreactivity. Int. Immunol. 16: 1055-1068. Scotto, L., A. J. Naiyer, S. Galluzzo, P. Rossi, J. S. Manavalan, S. Kim-Schulze, J. Fang, R. D. Favera, R. Cortesini, N. Suciu-Foca. 2004. Overlap between molecular markers expressed by naturally occurring CD4+CD25+ regulatory T cells and antigen specific CD4+CD25+ and CD8+CD28− T suppressor cells. Hum. Immunol. 65: 1297-1306. Bisikirska, B., J. Colgan, J. Luban, J. A. Bluestone, K. C. Herold. 2005. TCR stimulation with modified anti-CD3 mAb expands CD8 T cell population and induces CD8CD25 Tregs. J. Clin. Invest. 115: 2904-2913. Cosmi, L., F. Liotta, E. Lazzeri, M. Francalanci, R. Angeli, B. Mazzinghi, V. Santarlasci, R. Manetti, V. Vanini, P. Romagnani, et al 2003. Human CD8+CD25+ thymocytes share phenotypic and functional features with CD4+CD25+ regulatory thymocytes. Blood 102: 4107-4114. Nakamura, K., A. Kitani, I. Fuss, A. Pedersen, N. Harada, H. Nawata, W. Strober. 2004. TGF-β 1 plays an important role in the mechanism of CD4+CD25+ regulatory T cell activity in both humans and mice. J. Immunol. 172: 834-842. Rao, P. E., A. L. Petrone, P. D. Ponath. 2005. Differentiation and expansion of T cells with regulatory function from human peripheral lymphocytes by stimulation in the presence of TGF-β. J. Immunol. 174: 1446-1455. Allez, M., J. Brimnes, I. Dotan, L. Mayer. 2002. Expansion of CD8+ T cells with regulatory function after interaction with intestinal epithelial cells. Gastroenterology 123: 1516-1526. Rouse, B. T., P. P. Sarangi, S. Suvas. 2006. Regulatory T cells in virus infections. Immunol. Rev. 212: 272-286. Thornton, A. M., E. M. Shevach. 2000. Suppressor effector function of CD4+CD25+ immunoregulatory T cells is antigen nonspecific. J. Immunol. 164: 183-190. Manzotti, C. N., H. Tipping, L. C. Perry, K. I. Mead, P. J. Blair, Y. Zheng, D. M. Sansom. 2002. Inhibition of human T cell proliferation by CTLA-4 utilizes CD80 and requires CD25+ regulatory T cells. Eur. J. Immunol. 32: 2888-2896. Zheng, Y., C. N. Manzotti, M. Liu, F. Burke, K. I. Mead, D. M. Sansom. 2004. CD86 and CD80 differentially modulate the suppressive function of human regulatory T cells. J. Immunol. 172: 2778-2784. Manavalan, J. S., P. C. Rossi, G. Vlad, F. Piazza, A. Yarilina, R. Cortesini, D. Mancini, N. Suciu-Foca. 2003. High expression of ILT3 and ILT4 is a general feature of tolerogenic dendritic cells. Transplant Immunol. 11: 245-258. Chang, C. C., R. Ciubotariu, J. S. Manavalan, J. Yuan, A. I. Colovai, F. Piazza, S. Lederman, M. Colonna, R. Cortesini, R. Dalla-Favera, N. Suciu-Foca. 2002. Tolerization of dendritic cells by T(S) cells: the crucial role of inhibitory receptors ILT3 and ILT4. Nat. Immunol. 3: 237-243. Carter, L., L. A. Fouser, J. Jussif, L. Fitz, B. Deng, C. R. Wood, M. Collins, T. Honjo, G. J. Freeman, B. M. Carreno. 2002. PD-1:PD-L inhibitory pathway affects both CD4+ and CD8+ T cells and is overcome by IL-2. Eur. J. Immunol. 32: 634-643. Vlad, G., F. Piazza, A. Colovai, R. Cortesini, F. Della Pietra, N. Suciu-Foca, J. S. Manavalan. 2003. Interleukin-10 induces the upregulation of the inhibitory receptor ILT4 in monocytes from HIV positive individuals. Hum. Immunol. 64: 483-489. Park, H. B., D. J. Paik, E. Jang, S. Hong, J. Youn. 2004. Acquisition of anergic and suppressive activities in transforming growth factor-β-costimulated CD4+CD25− T cells. Int. Immunol. 16: 1203-1213. Zheng, S. G., J. D. Gray, K. Ohtsuka, S. Yamagiwa, D. A. Horwitz. 2002. Generation ex vivo of TGF-β-producing regulatory T cells from CD4+CD25− precursors. J. Immunol. 169: 4183-4189. Sung, J. L., J. T. Lin, J. D. Gorham. 2003. CD28 co-stimulation regulates the effect of transforming growth factor-β1 on the proliferation of naive CD4+ T cells. Int. Immunopharmacol. 3: 233-245. Mosmann, T. R., L. Li, S. Sa. 1997. Functions of CD8 T-cell subsets secreting different cytokine patterns. Semin. Immunol. 9: 87-92. Vukmanovic-Stejic, M., B. Vyas, P. Gorak-Stolinska, A. Noble, D. M. Kemeny. 2000. Human Tc1 and Tc2/Tc0 CD8 T-cell clones display distinct cell surface and functional phenotypes. Blood 95: 231-230.